Monday I ran 3 miles and felt great the entire time I ran. This was the complete opposite of last Friday’s run. I was exhausted almost the whole time I ran. Often I had to slow to a faster walk, not because I was out of breath, but because I just didn’t have any energy. So on Monday’s run while energy coursed through my muscles, I began to contemplate the possible causes of my energy depleted run. I came up with one prevailing thought. Last Friday, I ate a less substantial breakfast (eggs) and the night before I had limited my calories at dinner. However, on Monday the opposite was true. I ate a heartier breakfast and taken in more calories the night before. The difference was fuel! After this discovery, I began considering the need for proper fuel in my spiritual runs (the life marathon so to speak). Most of us are completely aware of the basic fuel needs to run the Christian life race such as personal Bible study, scripture memorization, prayer time, and church-going; however, we often neglect other fuels that increase our ability to run the race with more love and joy, peace and patience, well, you get the idea. So here’s a list of not-so-obvious spiritual fuels that allow me to run with more energy and enjoyment. 1. Spending time with friends. It is my hope that you have several types of friends in your life — some who live for Christ and those who might not. While the latter set of friends should be our mission field; the former set should be our spiritual fuel. We need consistent contact with those who encourage us in our walk with Christ. Now let me clarify. Just because I’m hanging with my closest bible study friends or the gals I sit near in church, doesn’t mean that we are analyzing scripture and recounting stories of God’s faithfulness in every conversation. Those moments are always great, but there are times when we just need to be “with” one another. Times to share laughter, visit the local mall, grab a coffee, or share dinner together. These moments allow us to share life, and when we return to our families and jobs, our hearts walk a little closer to Christ. Don’t have that type of friend, start praying, God will send one! a. When is the last time, you left your cell phone behind, turned it off and just became unavailable to everyone but God? b. When did you last take a walk alone, no headphones piping in music, just you and God enjoying the day? c. Can you remember the last time, you took a seat (maybe on the front porch) and just sat in silence, with only the whisper of a breeze? If you can’t pinpoint a time for any of these, it’s time to find your circle of quiet and then make it a sacred part of your life. Shut out the world so God can speak peace and have you all to himself for a while. 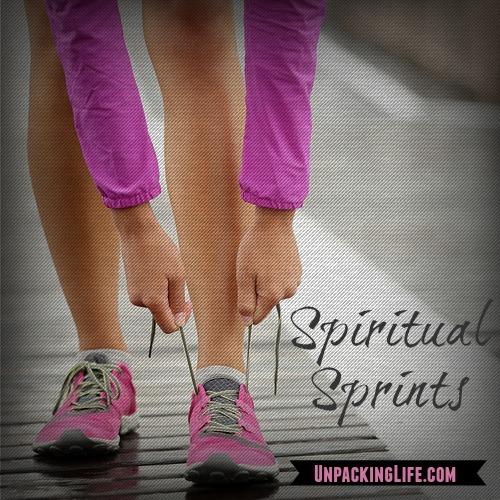 Make this a habit and your spiritual run will gain boundless energy. 3. Being a servant. Are you kidding, Alicia? I already give all I am to my family, my church, my job. Exactly! Those are the things that we are “supposed” to do. But what about the ones who don’t need us? Who don’t expect anything from us? What if we take a moment to create and give something of ourselves to those who don’t need it? Maybe we bake a basket of muffins to take to a neighbor — just because? Or we could simply send an encouraging note to the mail carrier, or our kid’s teacher, or the local fire department. I’m not talking weekly commitment, just a moment of giving. Even if you never see the benefits, encouraging someone gives you a new focus to be used of God: more fuel to run a steady spiritual race. I challenge you today to stop and think of ways to fuel your walk with God. Don’t sit by eating junk food and drinking sodas (metaphorically of course). Instead, find some real nourishment that pushes you to run with God wholeheartedly and contentedly. What other unconventional ways can we fuel our spiritual race? This entry was posted in Spiritual Encouragement on April 24, 2015 by aliciachall28.